A month ago, we asked you which MSU football student section t-shirt design you liked best, encouraging voters to pack the polls in favor of the TOSSS-approved favorite. Well guess what folks? It worked. The winning designs for the back and the front were announced today by MSU officials as the victor of the online fan vote, with the back design that won (seen on the left) garnering 46 percent of the vote. That was no surprise to us here and it was also the winner of the TOSSS poll. The three finalist designs for the front were all pretty similar. But the winner (seen right) won by an even larger margin - garnering 52 percent of its vote. Shirts will be distributed to student ticket holders beginning Sept. 1, but can be purchased starting in mid-August. 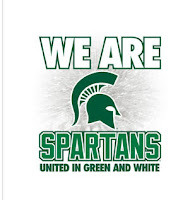 Proceeds go to the MSU cheerleaders, dance team and the Sparty program.